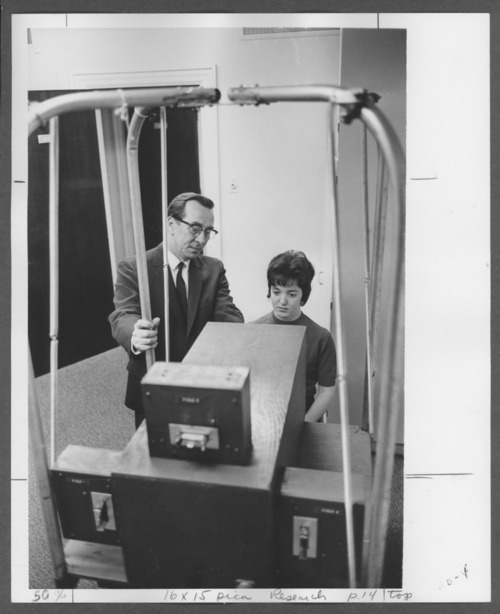 Dr. Riley Gardner, Director of the Research Department at the Menninger Foundation is testing a staff member. The Menninger Clinic is a facility for mental-health treatment, education, research, and prevention. It was started in 1919 in Topeka, Kansas, by Dr. Charles F. Menninger and his two sons, Karl and William. It grew into a recognized center for the treatment of mental illness, teaching about mental health, and research in the field. It was located in Topeka, Kansas, from 1925 to 2003 and is now in Houston, Texas.